Does This Random Celebrity Mii Look Like This Random Celebrity To You? 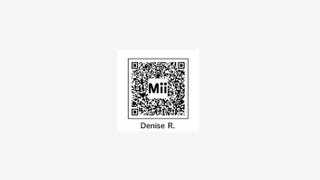 Here, for some reason known only to Nintendo and some publicists, is a QR code that will generate the official Mii of actress Denise Richards. This is probably not a collection of data you were expecting to get today. But now you've got it. If you have a Nintendo 3DS, can load up a Mii-making app, snap the QR Code and... voila! Nintendo is promoting this Denise Richards Mii... Video gaming sure is weird, these days. Maybe it always was? More celebrity Miis, courtesy of Nintendo, here.